We had reported earlier that, the Tamil film industry was imposed with a Goods and Services Tax (GST) of 28 percent. This was quoted to be very high by numerous film personalities and producers who requested a reduction of the same. There was a lot of pressure from the industry’s side to bring this down and even veterans like Kamal Haasan had said that he would have to quit cinema if there was no amendment by the government. Finally, there is some relief now as the government has brought down the GST from 28 percent to 18 percent. With the majority of the film industry asking for a remedy, this reduction of GST to 18 percent comes in as a much needed respite that would benefit the producers who are the pillars of the film industry and help churn out entertainment for the people. 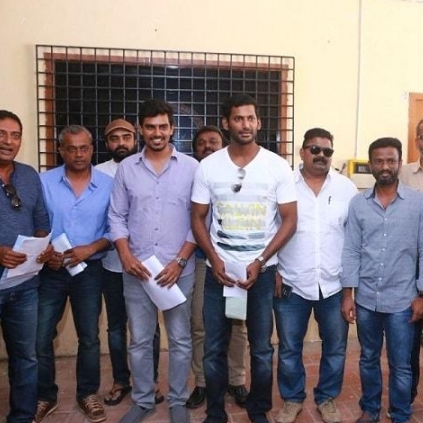 People looking for online information on Producer council, Vishal will find this news story useful.